The big game is right around the corner (ICYMI, the Super Bowl is this Sunday) and it’s time to focus on the most important part of the day: the food. If you’re not taking advantage of a Super Bowl special at your favorite bar or restaurant, it’s time to get your menu ready for the snack-a-thon that Super Bowl Sunday is known for. Lucky for you, we’ve taken the liberty of breaking down the recipes of some of our favorite football eats that are always a crowd-pleaser. Not only are these appetizers delicious, they’re easy to make and don’t take more than 30 minutes from prep to passing to your guests. Plus they’re lighter and less greasy than your typical football finger foods so they won’t make you feel as guilty for cheating on that New Year’s diet (we all do it, the diet gods forgive you). 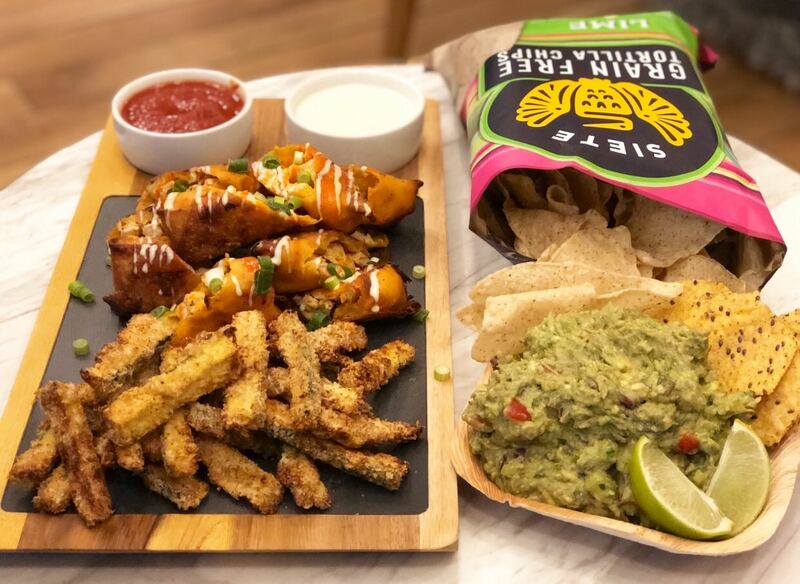 Check out the recipes below and start perfecting your touchdown dance, cause these snacks will have you #winning all game long! For this recipe, you have the option to buy a cooked rotisserie chicken and shred it OR buy raw chicken, dice into small 1/2 inch pieces and saute in a pan with 1 tablespoon of olive oil- either way works! When your chicken is ready, add cream cheese, Cheddar cheese and Buffalo sauce in a bowl and mix until combined. Once you have your mixture, add 2 tablespoons to the center of the egg roll wrapper and roll (following the instructions on the egg roll wrapper package). In order to seal the egg roll, you’ll need to use the scrambled egg. Use a brush to dip into the raw egg and rub along the edge to secure it (if you don’t have a brush, your finger works as well). Once secured, bake in the oven at 425 degrees for 12-15 minutes or until golden brown and crispy. Once cool, serve with your favorite condiment (we recommend Ranch or Blue cheese)! Pro tip: If you have it, these Buffalo Chicken Egg Rolls taste even better in the air fryer. Cook for about 8 minutes and enjoy! On a flat plate, add the Italian seasoned breadcrumbs, Panko breadcrumbs and Parmesan cheese. In a separate bowl, scramble the egg. Next cut off the ends of the zucchini and slice into individual “fries”. Once the zucchini is cut up, dip in the raw egg and then in the breadcrumb/cheese mixture to coat the zucchini. Repeat until all of the zucchini are prepped. Set the oven to 425 degrees and bake for about 20 minutes or until golden brown. Plate and serve with your favorite marinara sauce or garlic aioli. Yum! Pro tip: You can make the Zucchini “Fries” in the air fryer as well! Cook for about 6-8 minutes and serve! Chop red onion, Cubanelle pepper, garlic and tomatoes and place in a bowl. In a separate bowl, smash avocados up before adding to the bowl of vegetables. Add in chopped cilantro, salt, pepper and lime juice. Mix together until all ingredients are thoroughly combined. Serve with your favorite tortilla chips (for a healthier, grain-free option, we used Siete tortilla chips with lime) and indulge! If you’re testing out our recipes, we want to see! Take a picture of your creations and tag us @foodtoeat. Happy eating (and footballing)!